When speaking of Navajo tapestry, one weaving friend described the finishing process as “the last month of pregnancy, which is always the longest one.” This is in part because Navajo tapestry features a “continuous warp,” and those last rows are packed in so tight, with hardly any room left even to see what you’re doing. The very last row goes one warp at a time with a needle, pulling as hard as you can. And, when you’re finished on a Navajo tapestry, you’re really finished. There is simply no more room to weave! 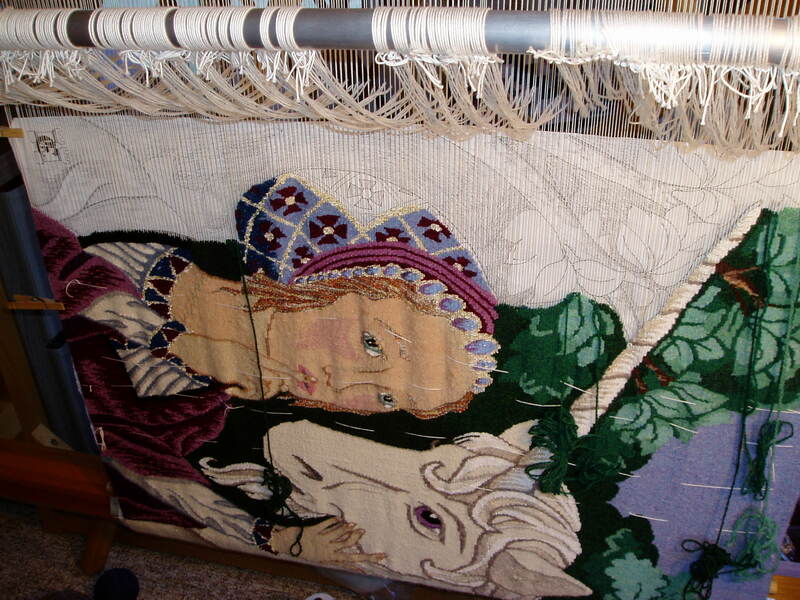 This is quite different with Flemish style tapestry. With the warp on rollers, there’s never a real feel of finish, except by matching up with the end of the cartoon. Tremendous progress has been made in reaching that goal just in the last few weeks! Leading up to the lady’s hair, the shading of the neck proved to be more of a challenge than I had expected, blending together colors from the face as well as the hands. Returning once more to my books of detailed images from the original Unicorn Tapestries, I noted a detail that had not previously caught my attention. On all of the young ladies, there is a delicate shading line distinguishing where the neck meets the shoulder. Not quite a “collar bone” line, it was more curving, as if to show a sense that the neck was round without drastic side shading. I decided to honor this tradition and added the light line just above her decorative collar and hand. Then it was time for her hair! The origami yarns I was using (which are bundles of smaller threads and strands, wound with a dark thread) offered great dimension but were troublesome to work with and stiff compared to wool. And, while most of the weaving happens in a back-and-forth horizontal fashion, this part (in order to create the sense of her curls) involved building up the part to the left and weaving at a 30 to 45 degree angle. This technique requires focused effort in order to avoid greatly distorting the warp threads. It was a technique I saw used on a period tapestry at the Cloisters Museum to portray the harp strings in a scene with King David, so I’m certainly not the only one to have found this technique useful in pictorial works! Next was to complete the unicorn horn. 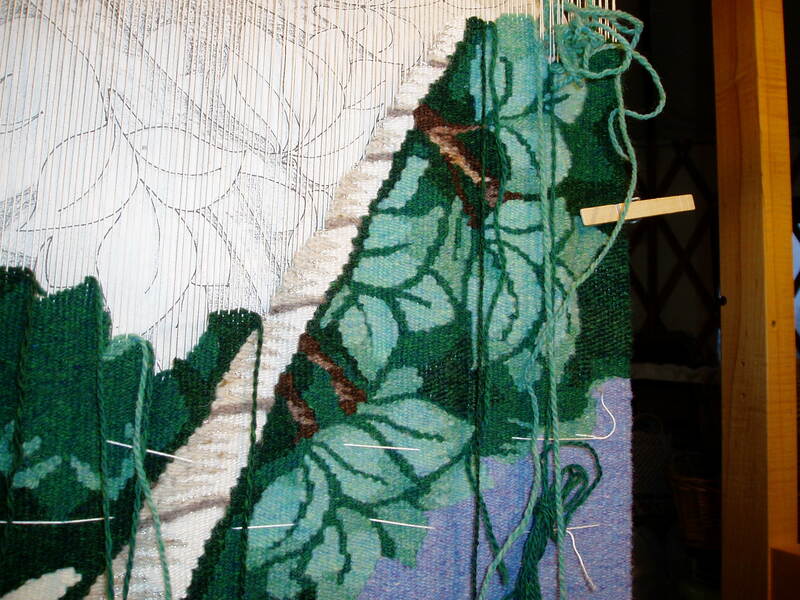 This means filling in all the beech leaves to the right to build up the tapestry to accommodate working the remainder of the long horn all in one sitting. Here I have the cartoon held up with a clip, showing how the remainder of that section is to be worked. How exciting to see that the horn section brought that part of the tapestry so close to the top of the piece! That was the first moment when it started to feel real–that this immense project was really going to be finished soon. And when that taste of the finish line comes, it’s hard to keep me away from the project! Almost every day now, I would be in the studio one to three hours each afternoon, and piece-by-piece, the tapestry grew and matured, and I internally celebrated the magic of watching a new part of the tapestry come together. 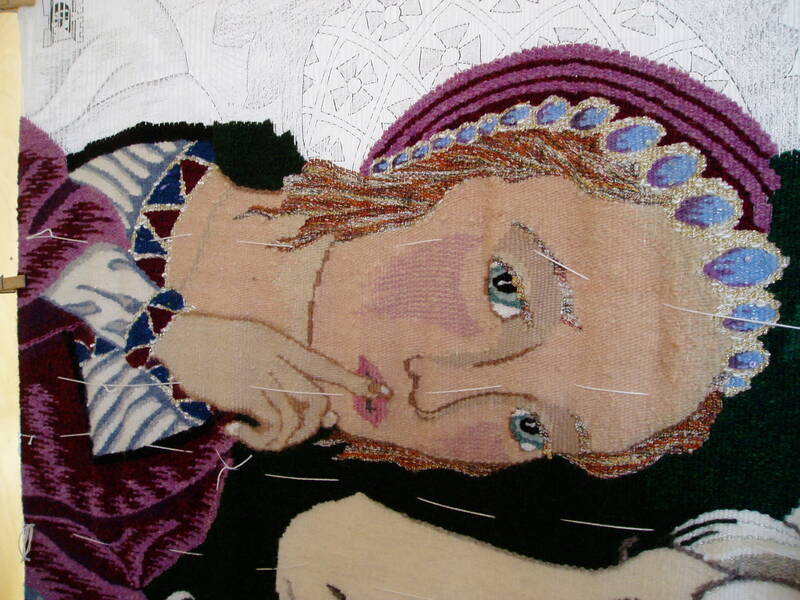 After finishing the horn, it was time to return to the lady, including her intricate headdress (which was inspired by the lady in another historic tapestry, as described in a previous entry). In design, it is very like a snood (beaded hair net, which I often make for my performance costumes) only made of an embroidered fabric with a floral and lattice design. This, along with her collar and cuffs, will sport freshwater pearls once finished, but I chose to weave the golden thread at the “flower” centers to add some shine around the base of where the pearls would sit. I knew that the headdress should be blue, but which blue? The sky color turned out to be perfect, shaded with the royal blue of her cuffs to add dimension. This created just enough color distinction between her hat and the jewels, but subtle enough not to be glaring. Oh, so close! Just her shoulder, leaves, branches, and the last of her headdress left. How many more hours? Oh dear, don’t think about that part… Still, “Deceiving the Hunters” is really coming together. I can taste it!